Lack of website traffic is one of the most common challenges for business owners. 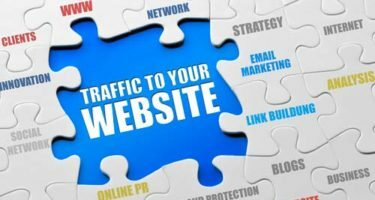 Many report having lost a significant percentage of their search traffic over the past year or two, and are continuously looking for new ways to drive relevant traffic to their site. Your website design should present the professional image that you want to project to your visitors. This will reinforce your brand, increase credibility, and help increase leads and sales. One mistake many websites make is to place too many advertisements and non-essential images on their site. Many visitors will find this intrusive and click the back button before even reading your content. If the aim of your site is to increase traffic and increase conversions, you should ensure your website design is both professional and practical. The longer (and more specific) search terms are, the easier it will be to rank on the term. Keywords that are more specific (and often longer) are usually referred to as long tail search terms. Long tail keywords are more specific and less common. They focus more on a niche. Make sure your posts include all the relevant terms and phrases related to your topic. It is much easier to rank for long tail keywords than for more common keywords. Another benefit for focussing on long tail keywords is that, although these keywords are used less in search, the visitor that finds your website using them is more likely to buy your service or product. Your headlines are what will get people in the door, particularly when you share your blog posts via social media; make sure they pique interest and clearly articulate the benefit to your readers. The subjects you cover will influence the kind of traffic your website attracts. If you publish many articles on a subject, you will attract a lot of the same website traffic. Likewise, if you publish a wide variety, you are more likely increase traffic with more experience on the subject. It’s vital that you plan and research what subjects to publish on your website and conceive a long-term content marketing strategy. This will generate targeted traffic from people that are more likely to subscribe to your blog and purchase your products and services. This doesn’t have to be the main focus of all your emails, but including a link or two back to your blog posts can considerably increase traffic, leads, and sales. When you write a post, always be sure to mention other posts your readers may find helpful; this is great for SEO as well as for increasing time-on-site, conversion rates, and referral traffic. Respond thoughtfully to all comments on your blog. This is great for building relationships, as well as for driving commenters back to your site. You don’t have to do what everyone else is doing. Study your analytics to see your main traffic drivers, and focus on your energy on these areas.